A common problem in processing of paper and other material is measuring temperature in an area in which steam (water) is used to heat and cool the material. The resulting steam vapor makes it very difficult to use non-contact infrared devices because steam vapor is opaque to infrared wavelengths commonly used, i.e. the sensor cannot see through the vapor fog very well, and thus would report temperatures that were too low. In addition, condensing steam vapor on the sensor lens would render the IRt/c completely blind to infrared wavelengths. The IRt/c air purge models solve the problems in a simple and inexpensive fashion. 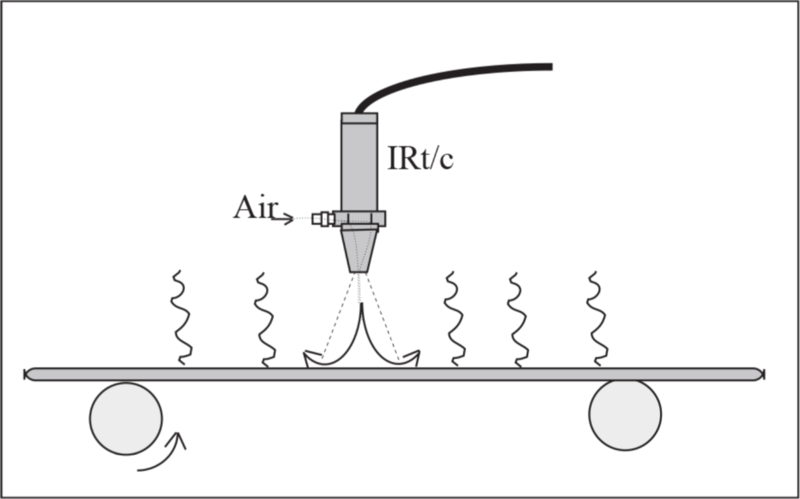 The air jet from the built-in air purge clears a path to the target material by “blowing away” the steam vapor in the optical path, replacing it with dry air. Care is required in the set-up of distance to the target and air pressure employed, to prevent cooling of the target area by the air jet.